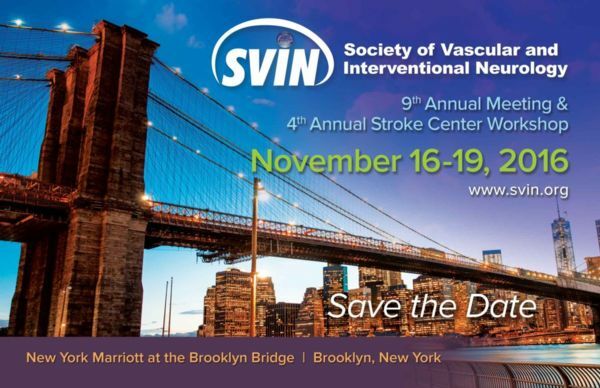 View the SVIN 2016 Program! Or, click here to view 2016 presentations (please note only those we received permissions from are available). SVIN would like to thank our TOP SUPPORTERS for their generous contribution and support of our meeting! In recognition of his outstanding contributions to training and mentoring of Interventional Neurologists. In recognition of his outstanding contributions to the field of Interventional Neurology. In recognition for his innovation in the field of Interventional Neurology. In recognition for his substantial service to the Society of Vascular and Interventional Neurology. The abstracts will be available for electronic viewing onsite via kiosks which will be located in the Promenade. You can also download a pdf of the abstracts by clicking on the links below. © 2016 SVIN. All rights reserved.